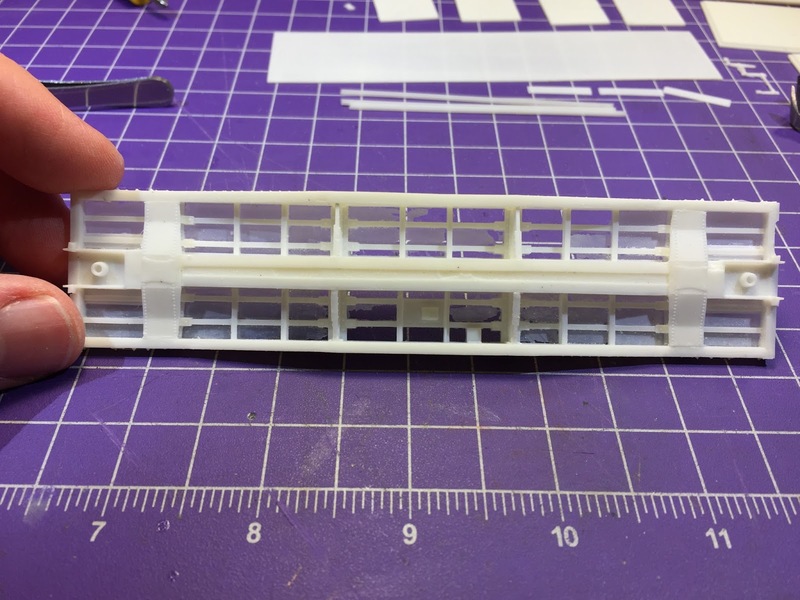 Between the distraction of dialing-in decoders and starting another resin kit last week, I'm afraid an important date passed by without my acknowledging it. 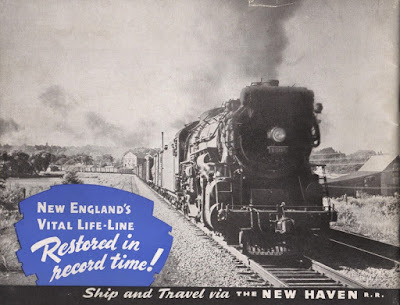 But I certainly didn't want this month to close without commemorating a somber - and for the New Haven Railroad, a devastating - event that happened on September 21, 1938 - The Great New England Hurricane. This storm was - and remains - the most powerful and deadly to hit New England in at least 300 years. It killed an estimated 682 people, damaged or destroyed 57,000 homes and cost an estimated $4.7 billion in 2017 dollars. Even as late as 1951, you could still see damaged trees and buildings. 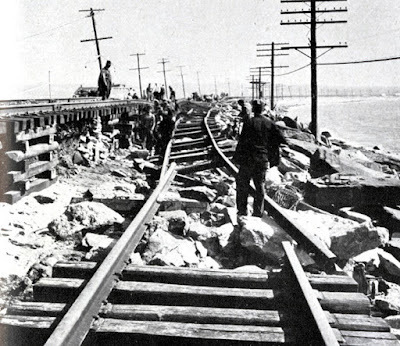 There are fewer and fewer folks that have first-hand memories of that fateful day 79 years ago, but thanks to the extensive coverage the storm received - not to mention the wonders of the internet that allow all that coverage to be easily saved and shared - the heroic efforts of the employees of the New Haven Railroad, including those on the Valley Line and most especially along the Shore Line, will never be forgotten. F&C kits are great in that they provide a wide variety of freight car types and are often the only model available of a particular prototype. But they do seem to lack a little bit in the prototype info and photo department. 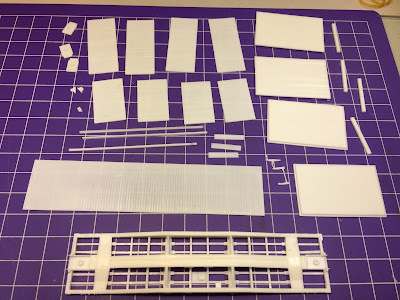 I'm certainly no expert, having built only 4 resin car kits in my life so far, but three of those were F&C kits (2 boxcars and a caboose). And all three benefited from additional prototype research and photos. No matter what railroad you focus on modeling, if you do any freight car interchange you're gonna have to know at least a little bit about equipment from other railroads. Unfortunately, there's precious little available information or photos of the Baltimore & Ohio class P-11 flatcar (106002-106699 series). I know Google is my friend, but sometimes friends let you down. Thankfully, Google isn't my only friend - I put the question out on the internet (through my blog and the Steam Era Freight Car yahoo group - a.k.a. "STMFC") and got some great information back. I always thought the mighty B&O was all nice and profitable until the Dark Ages of the 1960s when Merger Mania happened. 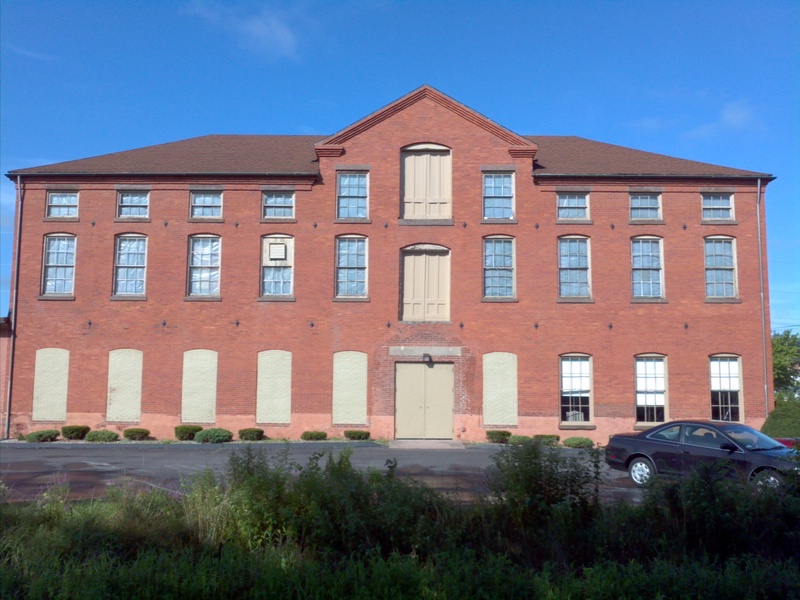 But apparently, it had its share of hard times and bankruptcies just like most other railroads. 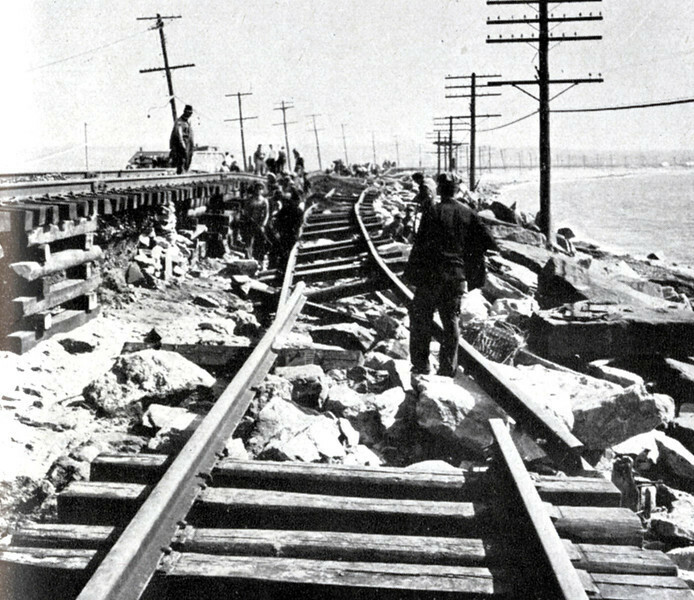 And in 1901, just as it was coming out of bankruptcy, the Mighty Pennsylvania Railroad gained control. It was during this period, specifically in 1902, that the B&O's class P-11 flatcars were built - duplicates of the PRR's FM class cars. 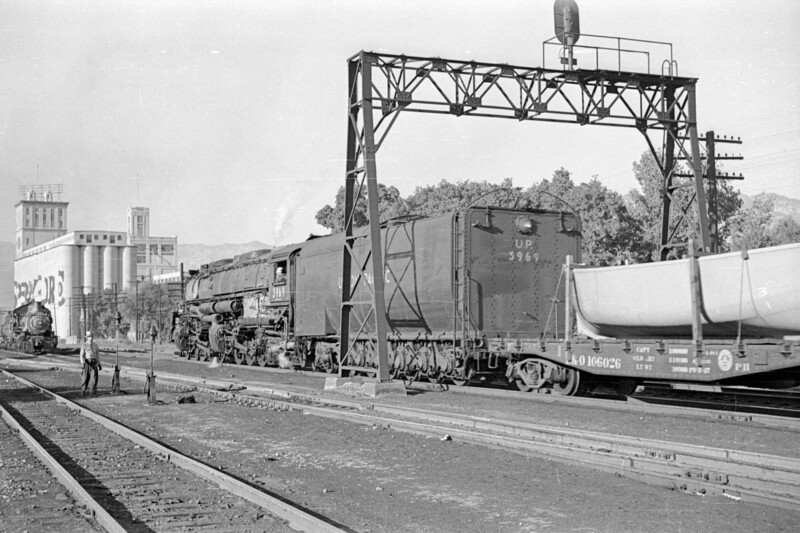 Sooo...... while info on B&O's P-11 flatcars is fairly hard to get, info on PRR's FM flatcars is much easier to find. 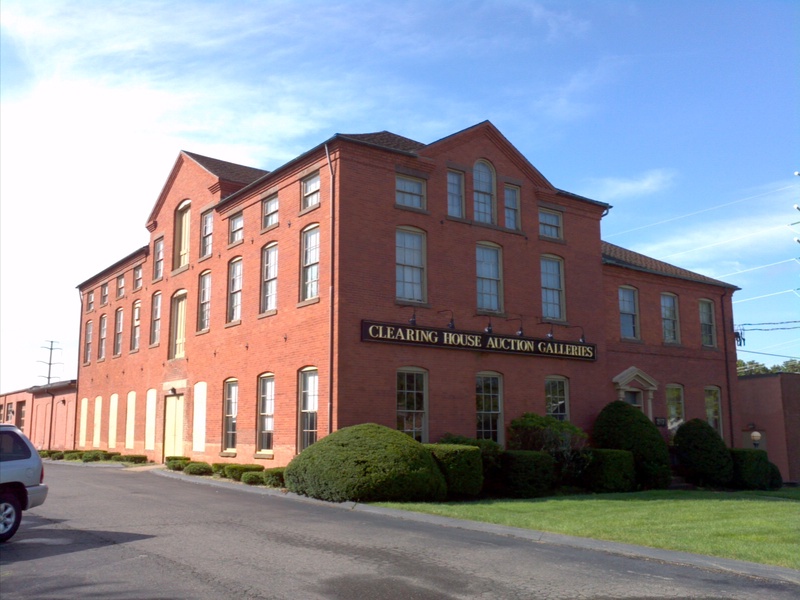 Specifically, this page devoted to the class. According to the information there (compiled by Rich Orr), there were 1,951 of these cars in service as of October, 1948. By contrast, there were only 485 P-11s left in service as of the October, 1948 ORER - this out of a total flat car roster that year of 829 cars, all but 19 of which were of 50 ton capacity. Here, courtesy Gary Laaskso (via STMFC), is a photo of one of these cars in service way out west. Ed Bommer (again, via STMFC) weighed in with some info on this shipment. Apparently, a company by the name of Welin Boat & Davit Co. in Perth Amboy, NJ built these aluminum life boats and this one must've been on its way to a west coast shipyard to outfit a former WWII troop transport that was being refurbished & upgraded. 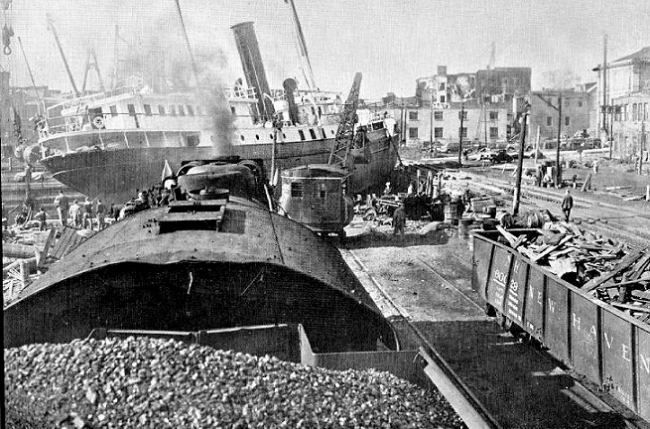 After the war, some of these old transports were being converted by the American President and Matson Lines to serve as ocean liners all around the world. 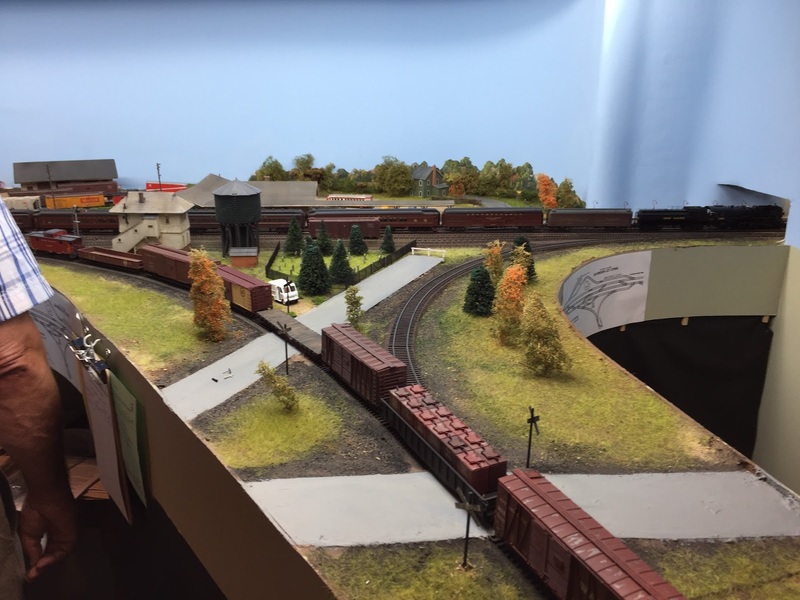 VERY cool info - thanks to Gary and Ed for providing the story of one of the jobs these flatcars performed. It certainly wouldn't be much of a stretch to have Welin ship a boat or two along the Shore Line through Saybrook - at least that's what I'm counting on! 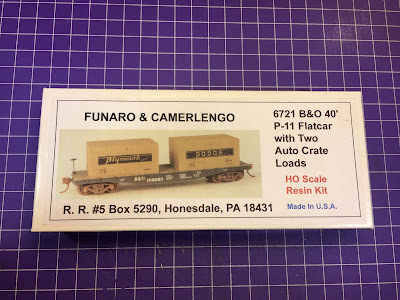 I don't have much use for a pulpwood car on my railroad, but if you do, this F&C kit could provide an appropriate starting point. 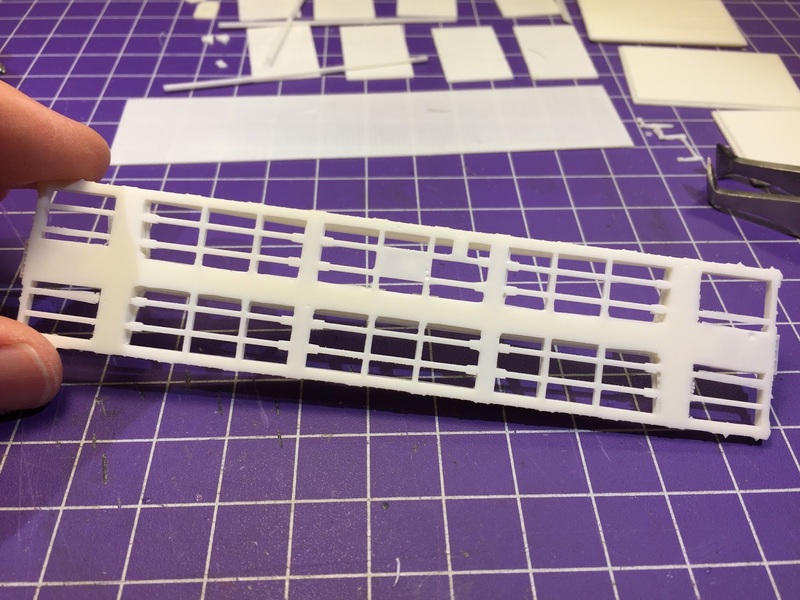 Anybody that's read this blog for a while has probably guessed that one of the reasons I'm a prototype modeler is that I really love the research involved. 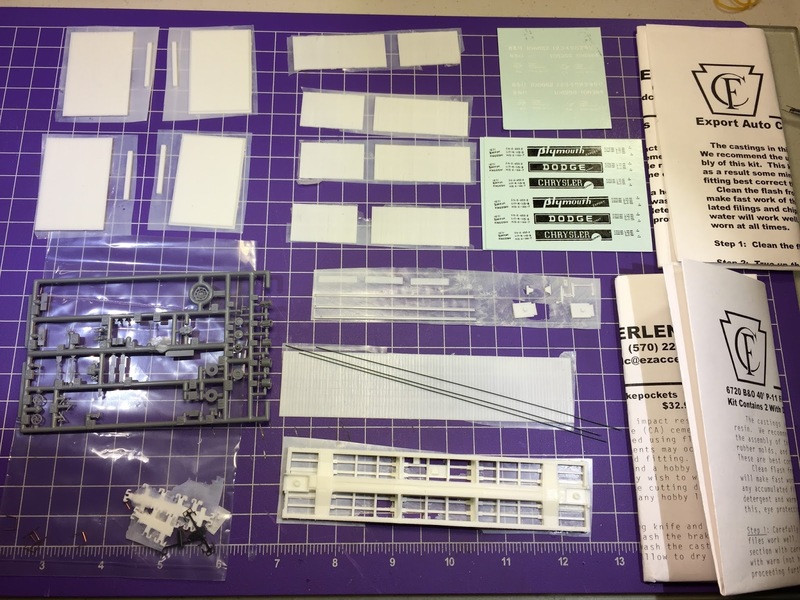 I mentioned to someone recently that it's not as if there's some sort of "freight car kit transubstantiation" that occurs when you're at the workbench, but when I'm building one of these car kits - especially if I've learned anything about the prototype, how it was built, what it was used for, etc. - it's as if I'm working on the real thing. 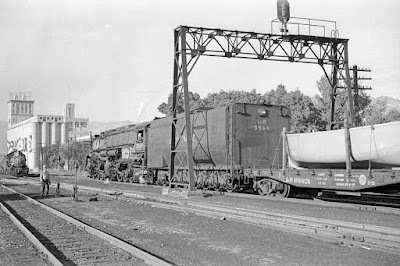 At the very least I hope, through engaging with the kit this way - and sharing my experience here - that I'm able to help keep the memory of these lowly freight haulers alive, at least a little. 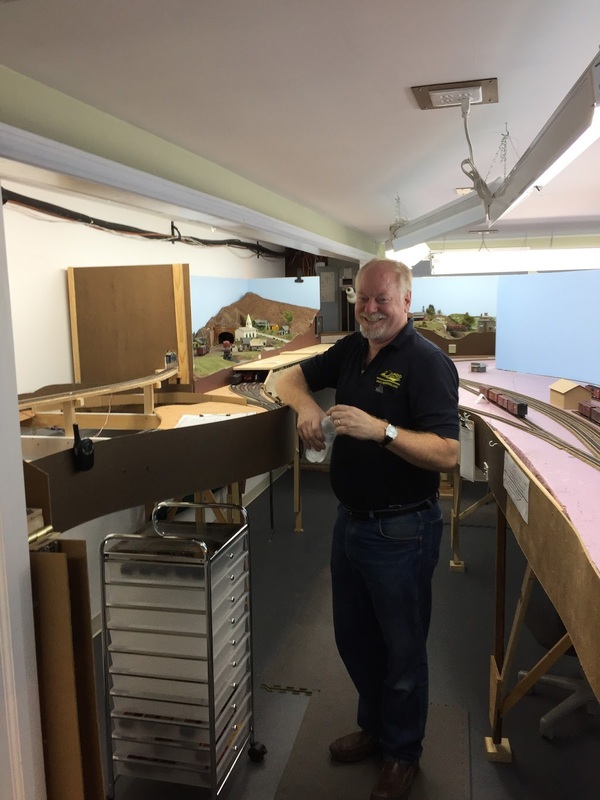 Thanks again to Gary Laakso for the boat photo, to Ed Bommer for the additional information on those shipments, and Tim O'Connor for additional photos. 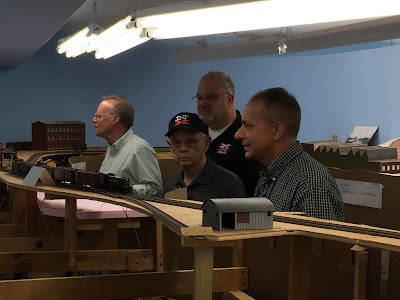 And a very special thanks to Eric Hansmann for the PRR prototype info and other great tidbits about these cars. Click here for photos of one he built from this same kit. Pretty good weekend finishing up installing bill boxes, train registers, and even some $1 throttle pockets. I even redid some of the paperwork to make it easier to manage. 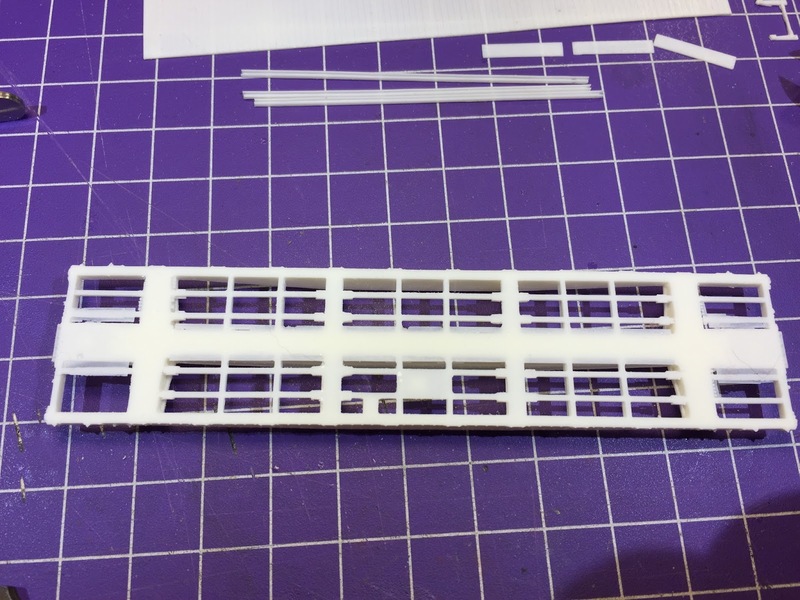 But I needed to get back to the flatcar I started on Friday. 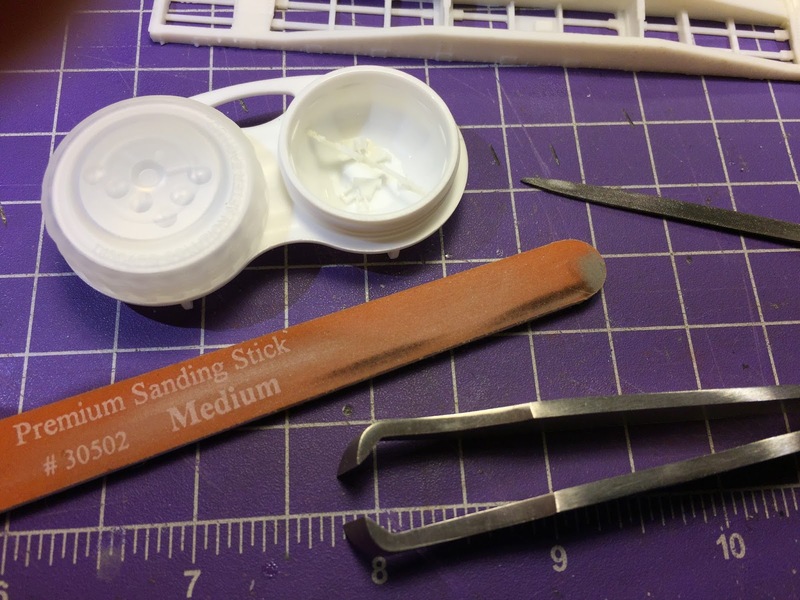 Medium sanding stick - to remove as much flash as possible while the parts are still on the sprue. 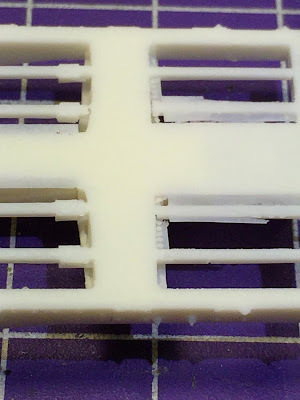 Sprue nippers (a loan from Pete since I - inexplicably - cannot find mine): helpful for removing tiny parts from sprues, although I used a single-edged razor blade as well. Old contact lens case, to hold the teeny tiny parts (and protected them from sneezes - ask me how I know). It just so happened that the thickness of the file fit the pocket perfectly. 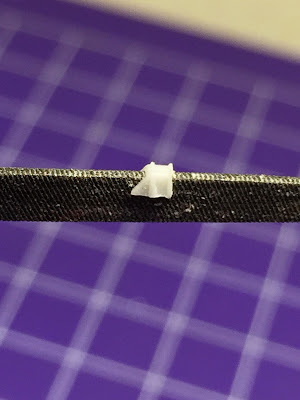 The needle file also helped me remove the remaining flash from around the pocket and square off the back. It was, as you can imagine, a fairly tedious job - but listening to old-time radio shows with the missus passed the time nicely (we're currently on a Nero Wolfe kick). Before starting actual assembly of the car itself (the next step would have been to start gluing on all those pockets! ), I decided to work my way up to it by building the shipping crates that came with the kit. It's a good thing I did . . .
(I have to admit, I've been pretty smug proud of myself that I've been able to keep my ACC nice and liquid for I-don't-know-how-long. After I use a bottle, I make sure that the nozzle is perfectly clear, then I cap it, then I place it in a Ziploc bag, squeeze out all the air, and seal that, and then I wrap a rubber band around the whole thing. As I said, these bottles of CA (one medium, one thin) have lasted for at least a couple of years. Or so I thought. I went to use the thin CA to assemble the crate and couldn't get anything to stick. I tried a few times (remembering to sand/file away any CA residue before trying again - CA doesn't stick to itself) and still nuthin'. I'm just glad I tried all this out on what are essentially boxes. They were pretty straightforward to assemble - just be sure to follow the instructions: glue ends to top first, then sides, then bottom. 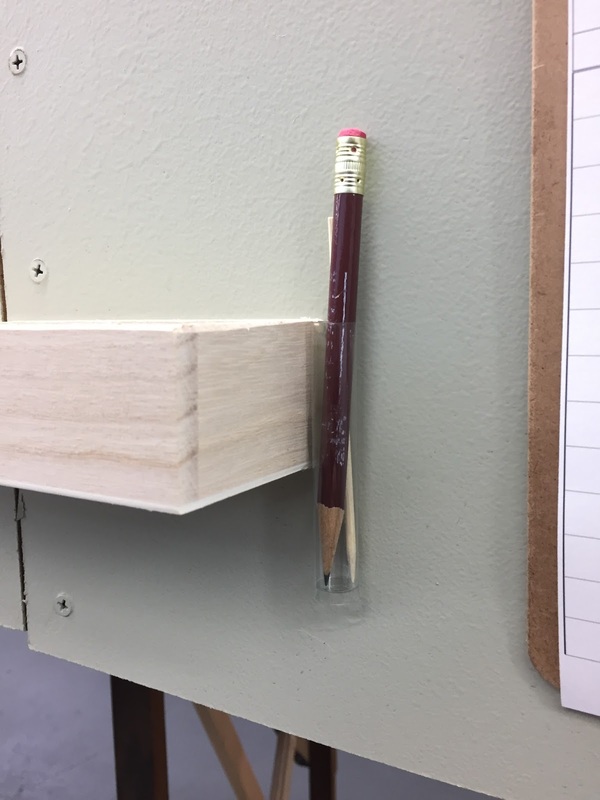 The sides in my kit had to be sanded/shortened by about 1/16-3/32" in order to fit. Since I still wasn't quite ready to tackle the pockets, I decided to drill & tap the holes for the truck mounting screws. To do this, I used my dial caliper to find the center point of the bolster, then used a push-pin to make a guide hole at that point. 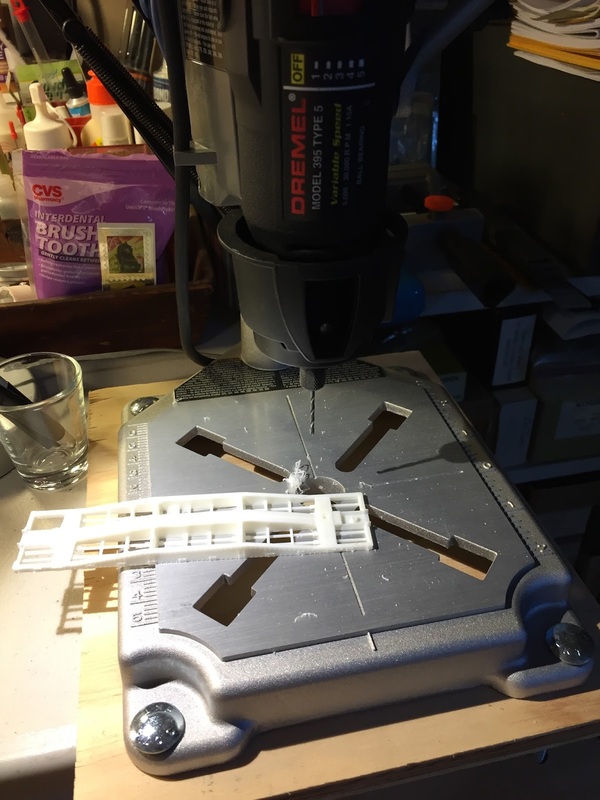 Then I decided to use my drill press (for the very first time!) to drill the holes (click here for how I mounted this press to a plastic work table). Since I'd be tapping the hole for a 2-56 screw, I used a #50 drill bit (tap bit) to make the hole. 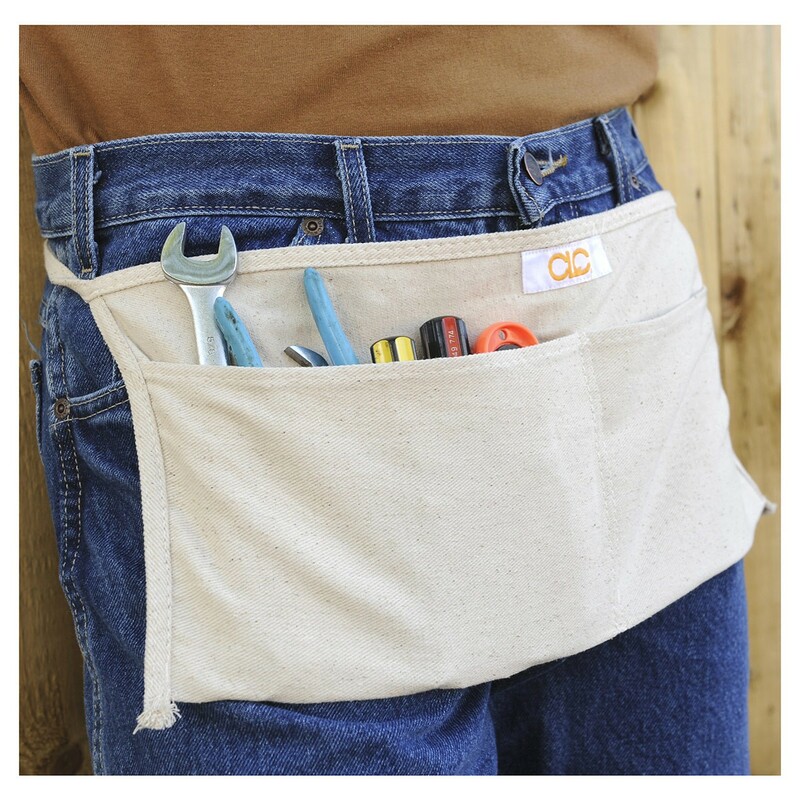 Once I ran the tap through and confirmed that the screws would work, I couldn't put off the pockets any longer. Thankfully, once I thought through how best to tackle them, they went on quicker and easier than I thought they would. 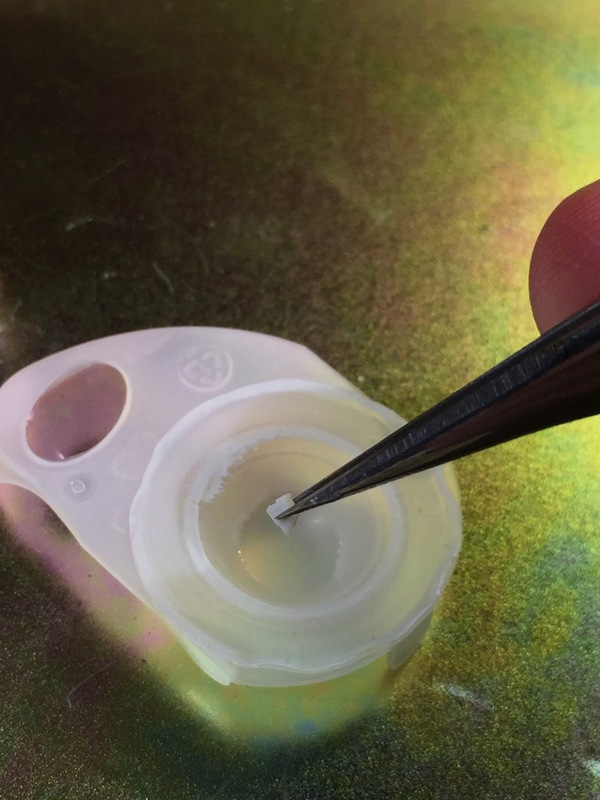 For me, the key was to have the car secured on its side and, using my tweezers, I would dip each pocket into a pool of thick CA and then place it on the side of the car. This is very steady-hand work: you don't want to dip the pocket too far in - just touch the glue. Otherwise, you risk getting it on the tweezers. 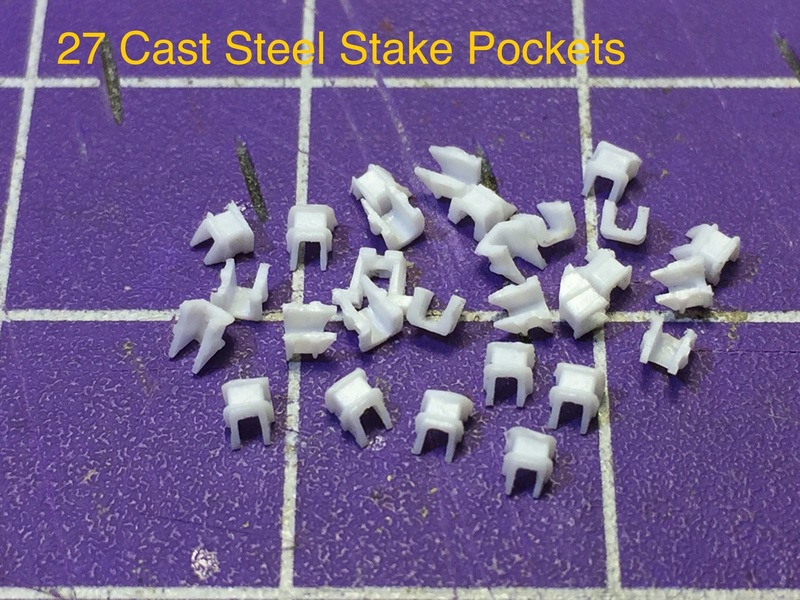 I did 3-4 pockets at a time (there's 12 per side), looking at them from different angles to make sure they were straight. Once they were where I wanted them, I touched each of them with a microbrush dipped in CA accelerator, which made for a quick-cure joint. And there you have it - hopefully the hardest part of this build, done. I decided I'm not going to bother with brake rigging & underbody - I want/need to add a lot of weight to the underframe and besides, the side sills would hide it all anyway. Next up, need to do some more prototype research and gather some photos (I'm comin' for you, Eric Hansmann). I have to do the grabs and such and the kit is a little light on location information and such. 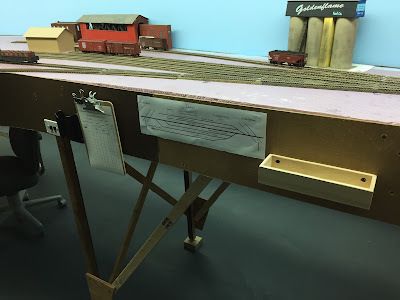 While staging trains for a recent operating session, I discovered that I need more flat cars. 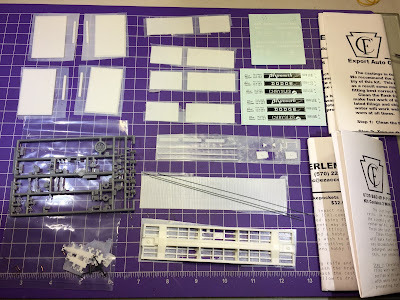 Unfortunately, despite my having a stash of uncompleted freight car kits (sound familiar? 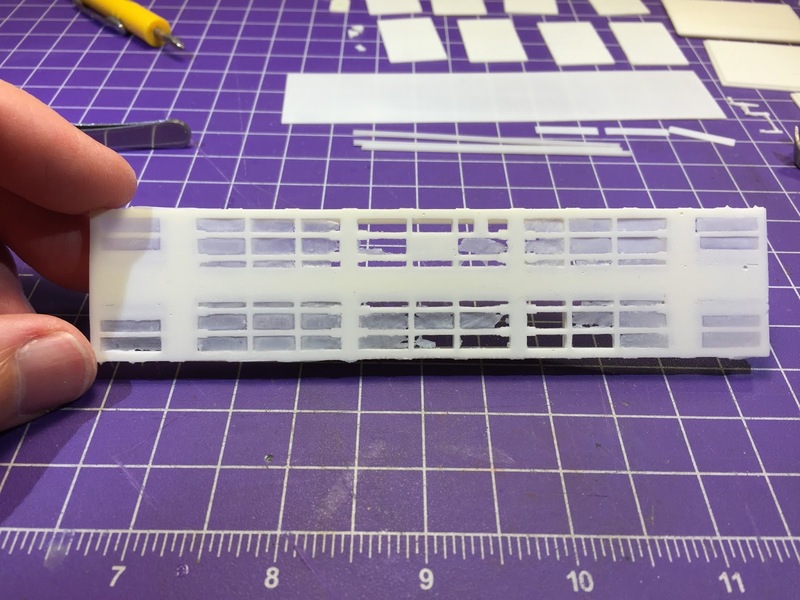 ), I found only one flat car kit - and it was a resin kit at that. 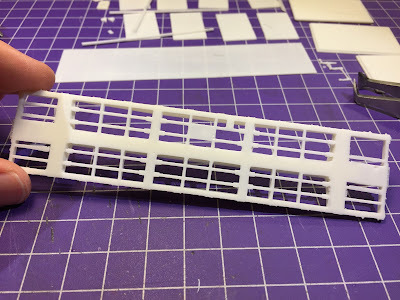 Not really something I could just bang together quickly - but figuring 1) I need flat cars, and 2) I really need to complete some of these kits, I decided to dive right in. But I don't have to know that much about the prototype to have fun with the "unboxing" . . . 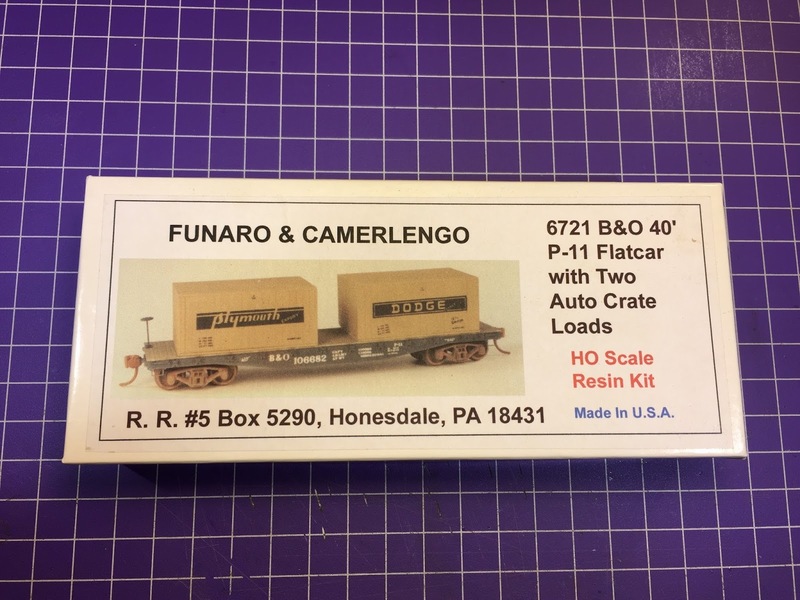 Here's what you get - parts & decals for the flatcar, as well as two crates for a load. LOTS of flash to remove in order to prepare for assembly. 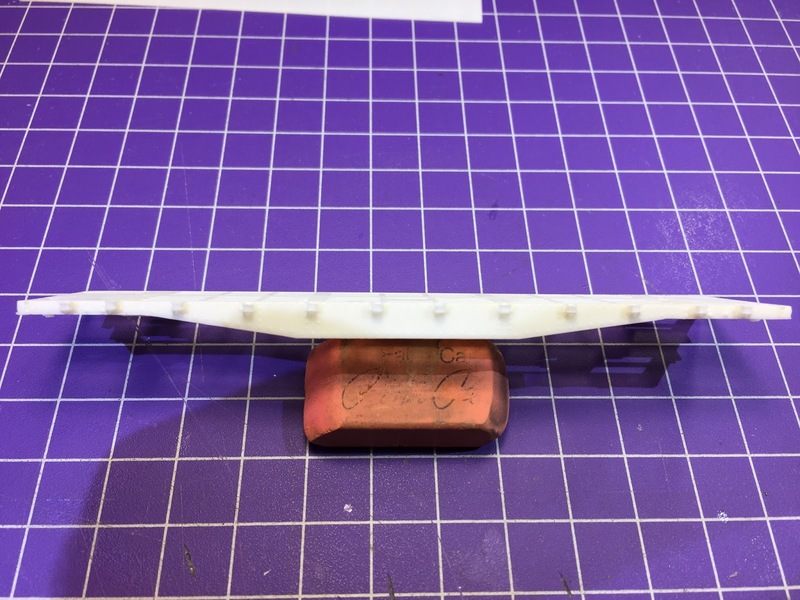 Most of the flash is pretty straightforward to remove - just be patient with a sharp blade and a flat mill file and/or sanding stick. 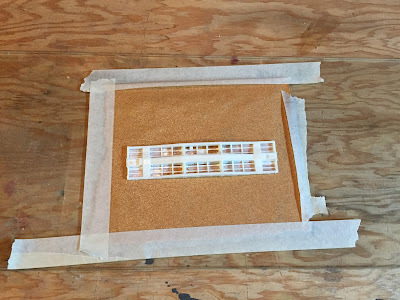 "All you have to do is" attach some sandpaper to a flat surface - such as a plate of glass as here - and then sand, sand, sand until the flash is gone. Sound easy? It's certainly easier than going at each little area with a blade and a needle file. But there's one important caveat . . .
You can go too far. Note that I managed to detach the supporting member in the lower left corner. Apparently, the resin casting - at least of the cross members - isn't a consistent thickness. Guess I shouldn't have been surprised. 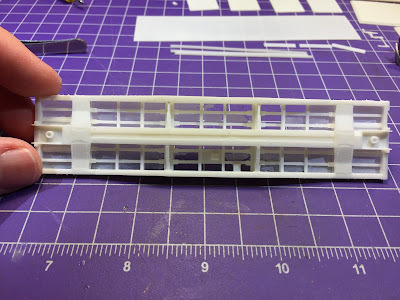 While the photo above shows that most of the flash is gone (and it only took me about 20 minutes to do), there's still some flash around the coupler pockets and along both sides of the center sill. So I figured I'd just keep sanding. That was a mistake. As you can see from this super close up, I went a little too far with the sanding. Yup - you can make out the back side of the rivets there, hanging by the slightest wisp of flash. So, out came the scalpel for the final removal of flash from around the couplers and center sill. 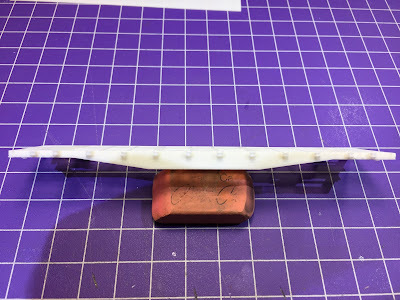 That took a bit more time to do carefully, but all the sanding didn't leave that much to do and what flash was left was very thin and easy to remove. The photos above show the finished/flash-free frame. Lesson learned: Next time I'll strike a different balance between sanding and carving/filing. 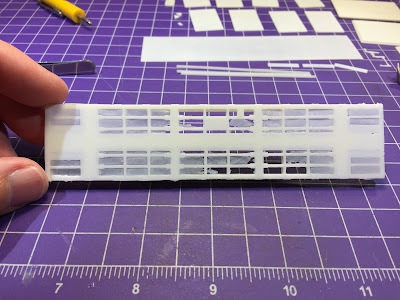 I'll definitely use the sanding trick next time I have anything like this with many crosspieces or slats - I'll just be sure and stop and switch to another method before I go too far. 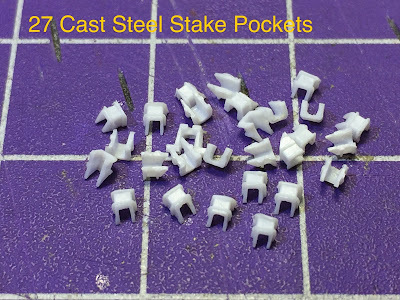 And here are all the pieces (well, except for the stake pockets) all free of flash and ready for assembly. Nice contrast from the beginning photo and not at all bad for an evening's work. Hope you enjoy following this build as I document my effort here. And if you've ever built this - or a similar - kit, I'd love to hear any tips (or warnings!) you have to share! It took me a while, but after many operating sessions and some trial-and-error (not to mention the fact that I rarely have the opportunity to operate my own stuff...), my DERS-2b (New Haven Alco RS-2) is finally dialed-in and running the way I want it to - which is to say, like the real thing. Now, I don't pretend to know everything there is to know about how a real diesel locomotive is supposed to sound & feel when operating, but I know a little bit more than the average guy since I started training to be a diesel engineer. I know, for example, that even a loco running by itself (aka a "light locomotive") doesn't get-up-and-go like your car as soon as you move the throttle. The traction motors have to spool up and the engine starts off slowly. This effect is even more pronounced when it's pulling cars. So one of the settings I always change on my decoders is the acceleration setting (CV 3) - and, yeah, it's admittedly a little on the high side. 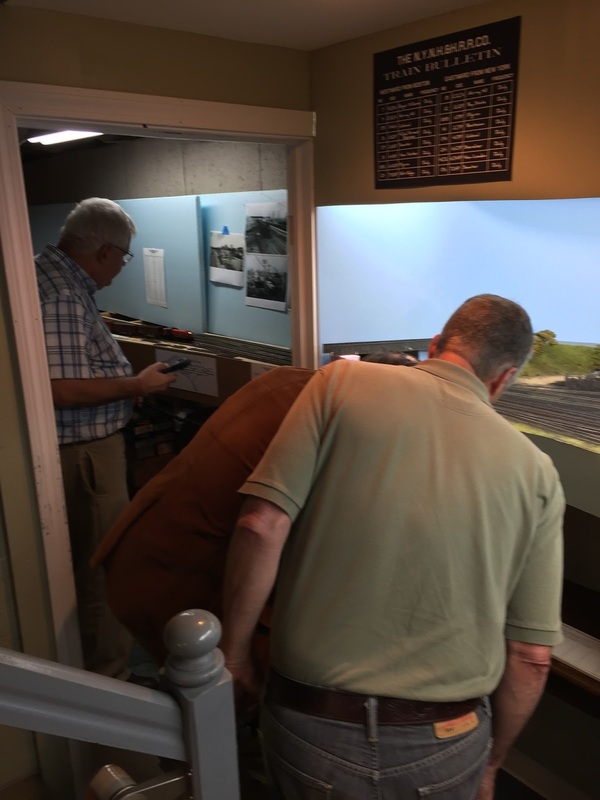 Newbies have to get used to the feel of the throttle and learn how to run the locomotive safely - just like on the real thing. And the same rationale goes the "other" way - which is to say, when the throttle is turned off a real locomotive doesn't immediately stop. It'll coast a while. Sometimes a LONG while - until you apply the brake. So I also set the deceleration setting (CV 4) pretty high. 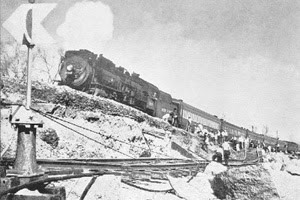 I first experienced the "brake" function on a model locomotive when a buddy installed a Tsunami in my K-1b steamer. That thing coasts on and on, rods clanking, until you apply the brake. Another friend moved the brake function from F11 to the easier-to-use F7 button. That K is still one of my favorite engines. But the DERS-2b, with an ESU/Loksound decoder installed really takes the cake. The Full Throttle/Drive Hold feature allows me to replicate all the sounds and most of the feel of operating the real thing. The brake feature was a little tricky to get just right (and you can use the Drive Hold feature similarly), and I've moved it to F6 (which is the last key shown on my throttle's display), but that engine has all the bells and whistles (excuse the pun) that I enjoy about diesels. Steam is still my favorite, but this Alco comes in a very close second - an "honorary steam engine" even without actual smoke. The DERS-1b (Alco RS-1) was a bit more of a challenge for some reason. I just couldn't get it dialed-in the same for the longest time. Then the obvious finally occurred to me - just copy the CVs. Both engines have Loksound decoders with Full Throttle - just different sound profiles (Alco 539T vs. 244 prime mover). Consequently, I used my LokProgrammer to copy my RS-2 settings to a file and then loaded that file to the RS-1. Voila!! Now they both run the same, which is to say - Fantastic! So that's "The Rest of the Story" and the explanation for what I was doing last night. This week's Wordless Wednesday is a quick grab shot of my DCC/decoder/workbench setup: LokProgrammer & Test Track, along with "loco cards" listing all the functions for each engine. Click on the links to read more about each (including how - or more interestingly "why" - I built the test track the way I did). Ever since I started operations on the Valley Line, I've required my crews, each time they enter a new town on their route, to "report to the Agent/Operator" for their work in town and any new/additional train orders issued for them. They already know what to do with the cars in their train, but they don't know what cars in town need to be picked up - and/or what additional orders they may have - until they check with the A/O. So they have to physically walk over to the desk (pictured above) and see the A/O seated there. And if he's not there (i.e. if he's investigating why somebody keeps shorting out the layout, just to pick a random example :^), then there's a bell to ring to get his attention. 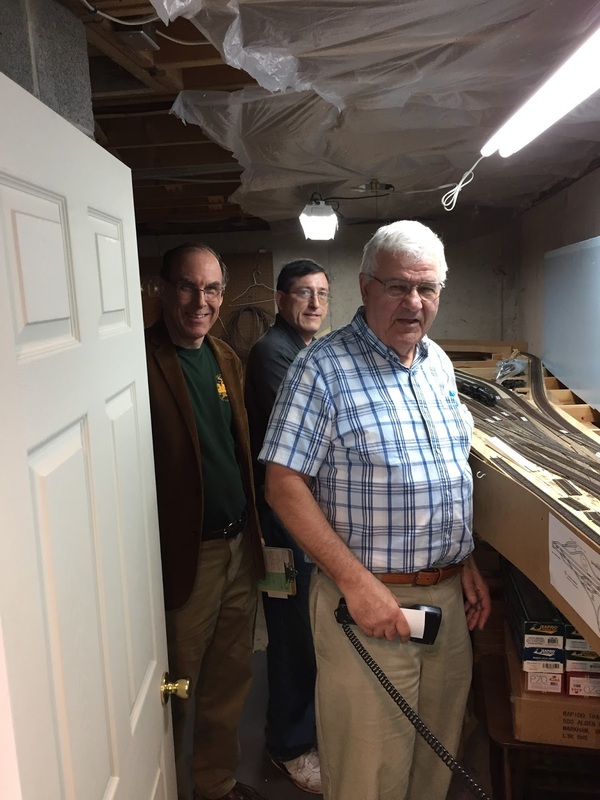 It's a very prototypical way to operate and keep the crews engaged, but it's a fairly unique way of doing things on a model railroad. 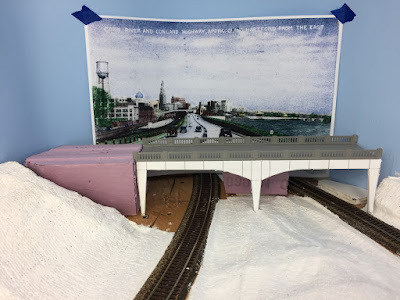 But lately - especially since the Saybrook Tower was completed - that A/O position has gotten very intense and stressful, what with having to be a towerman, throwing switches for Shore Line express trains, and be the A/O at the same time, managing local freights on the mainline as well as dealing with the local crews out on the branches. That may be the height of prototypical fidelity, but it's become increasingly clear why these guys were paid to do this job (or "jobs" since we're actually talking about 2-3 different roles here). 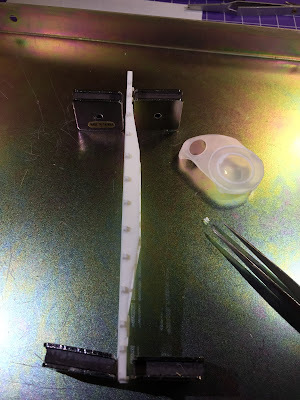 And even if I didn't mind doing all this work - or, more typically, pawning it off one someone else - as my crew sizes have grown the two liftouts that are required during part of the session have become real obstacles to the crews reporting in. So I've decided to provide another option. 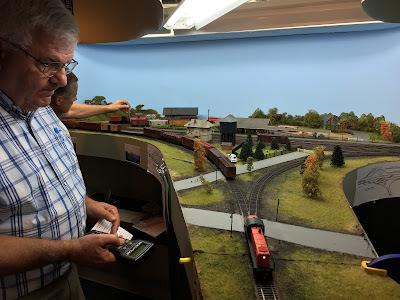 I can still revert back to the full A/O/Towerman job if/when I want to, but in the meantime I've limited the "desk jockey" job to the Towerman and have offloaded the A/O tasks to a Train Register and Bill Box located in each town. Now, when a crew comes into town, instead of walking over to the desk to report in and get their work/orders, it's as if the agent has gone off duty. Everything they need is at the station, either on the clipboard or in the bill box. 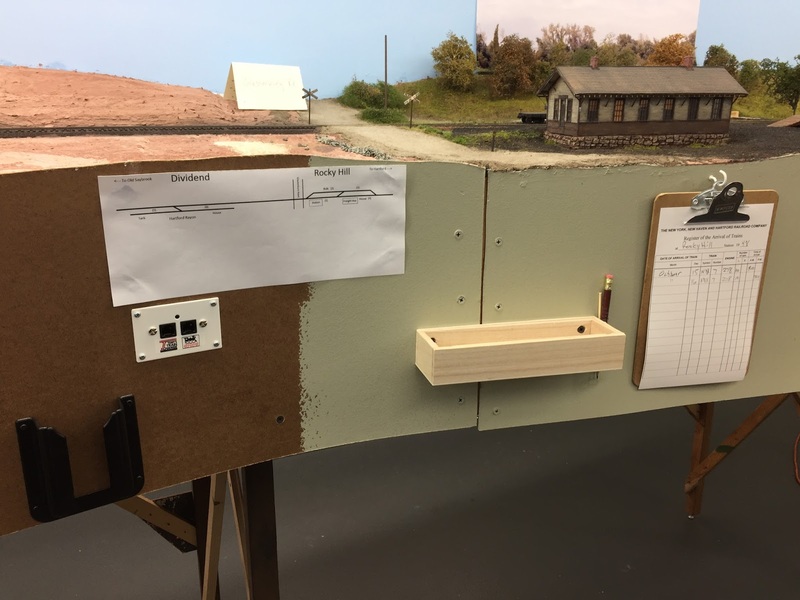 The above photo is a typical "station" set up: Throttle pocket, plug-in, track map, bill box, and train register - all located, appropriately, near the station. 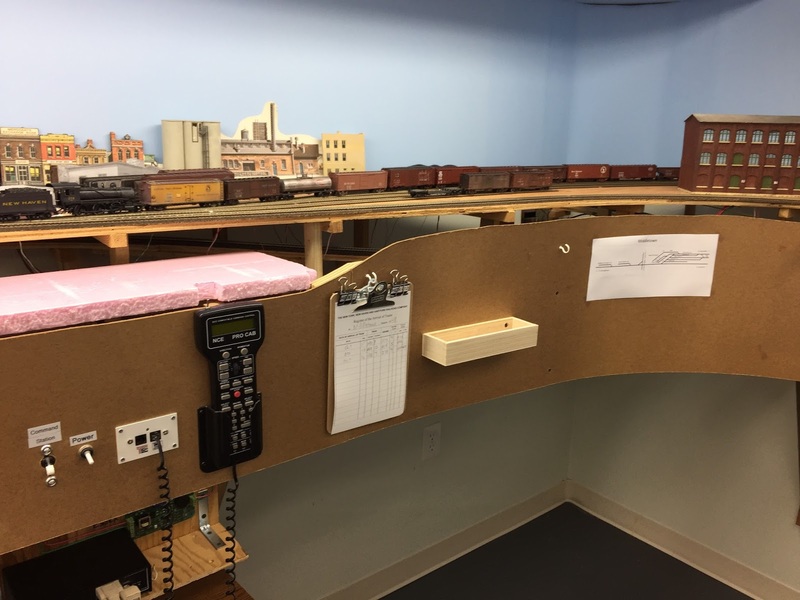 The first thing a crew (specifically, the conductor) has to do when he arrives in town is go to the "station" and register - recording the month, day, train, engine number, number of cars, and time. A closeup of my (admittedly "proto-freelanced") Train Register is below. Click here for where I got the inspiration and how I did it. Not shown are the switchlist(s) and, where appropriate, additional Form 19 train orders that would be sitting in the box for the conductor to take. The switchlist tells the crew what cars in town need to be picked up and where they're going. If I ever get around to doing waybills, they'll be in the box instead (and the conductor will have to use them to fill out his own switchlist). Until then, I fill out the switchlists myself beforehand and leave them for the crews. 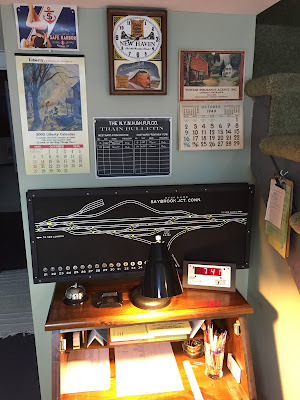 Certainly not as "railroady" as a caboose - or even a desk - but certainly less cumbersome to move around in my basement. . .
As you've probably guessed, if you've been following this blog for very long, one of my favorite aspects of this hobby is operating the trains as close to prototype as possible within the constraints of its being a model railroad and not the real thing. Compromises are inevitable, but I think I'm getting pretty close. 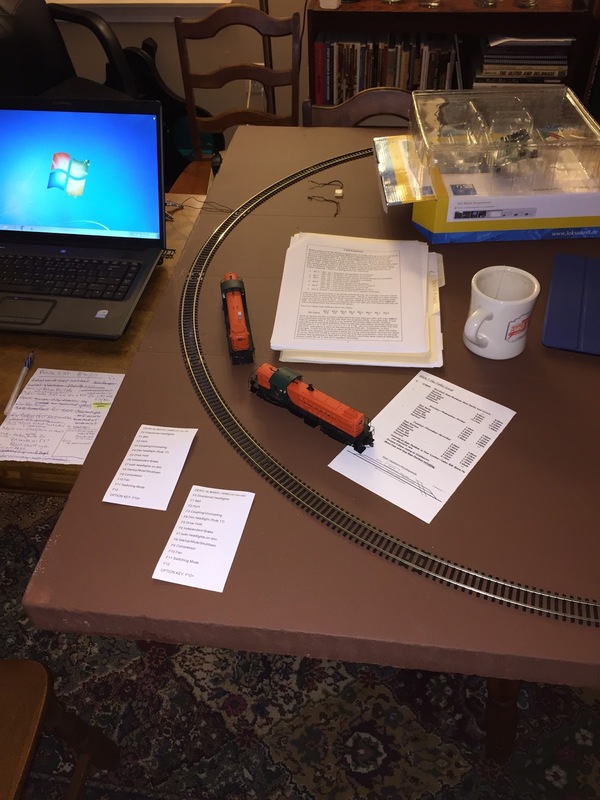 Nevertheless, I'd be very interested in any additional tips/suggestions/feedback on how YOU manage operations on your railroad - everything from what car forwarding system you use to what "helps" you provide to your operators, as well as how much work you require them to do. "Modeling jobs" may be prototypical, but as I discovered, there's a fine balance between what's "fun" and what's "work." I'd love to know how you strike the right balance. When you start out building your first real model railroad (as opposed to just having the track go 'round the Christmas tree), one of the first things you confront is the inherent tension between your chosen scale and your available space. You may envision a transcontinental transportation system, but if you want to be true to scale, there's no way you're going to be able to fit that in your basement, much less your spare bedroom. 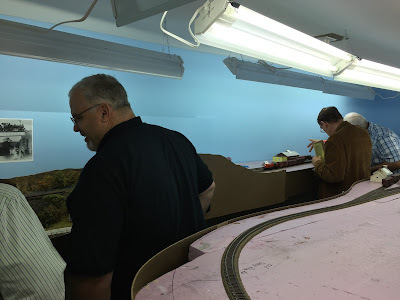 Even in N scale, that three mile shortline you resigned yourself to will still take 90 linear feet(!) to do to scale. So, we select certain areas to compress. 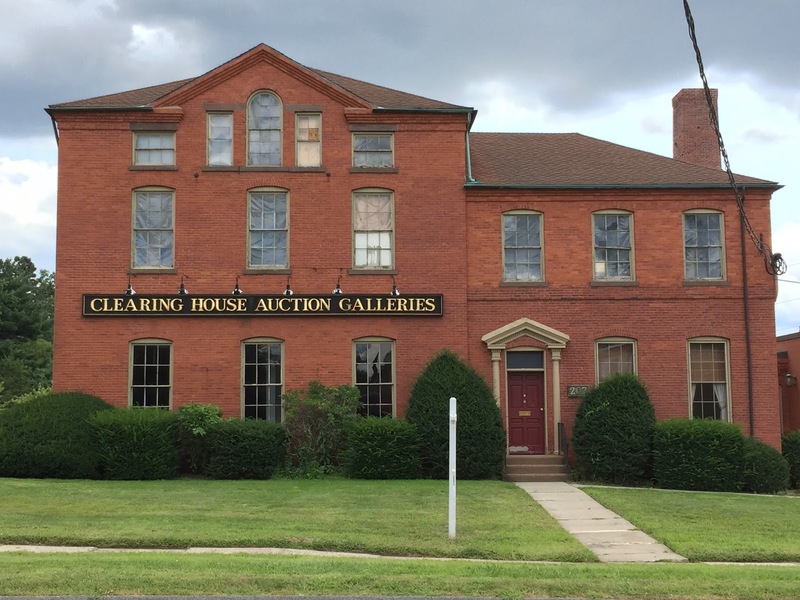 This "selective compression" typically eliminates the "boring" bits between towns. Sure, we don't have as much "mainline run" between towns as the prototype did, but that's a compromise most of us can accept in exchange for having a railroad that "goes somewhere." Even my pike, as satisfying as it is operationally, compresses about 50 miles of mainline into approximately 120 linear feet - barely 2 miles in HO scale. So much for the mainline. 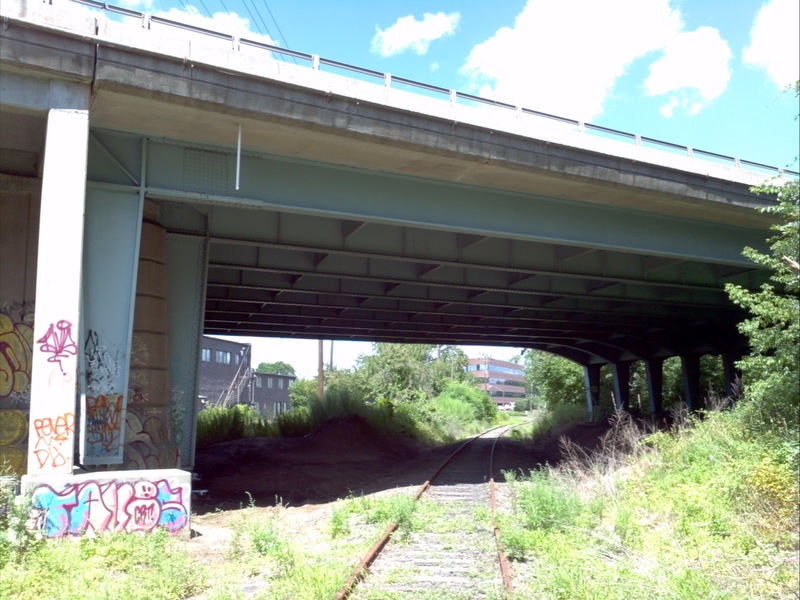 What about structures? Surely, we don't have to compromise there - we can always build them to full scale, can't we? Well, that depends on what you're building. Most of us are glad the days are behind us of model factories being only about as large as one boxcar. 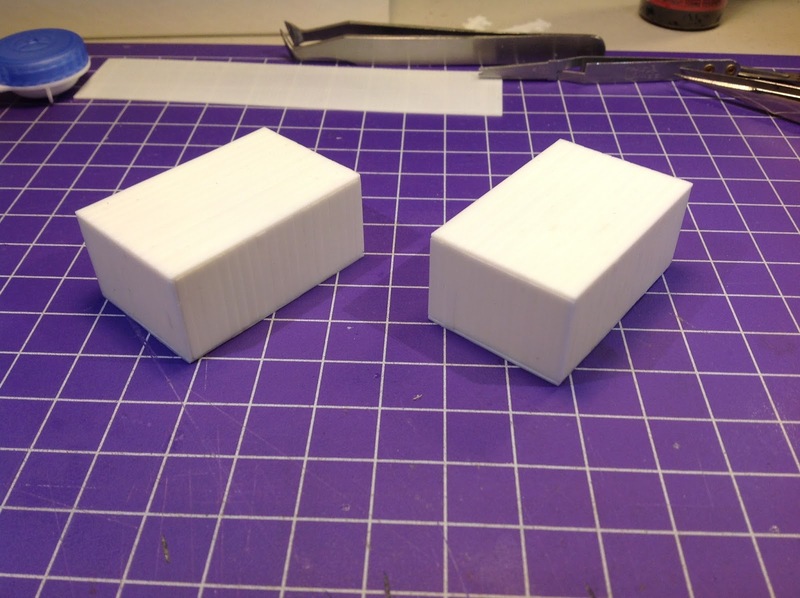 But the larger the prototype structure, the more likely it will "have to" be compressed. 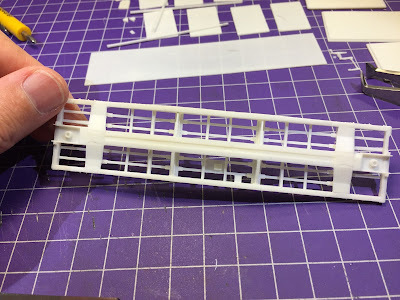 "Have to" isn't always bad though - many times, you may actually want to compress a structure in order to have it fit the scene, especially if building it to full scale actually "looks" too big. Which one is "correct"? 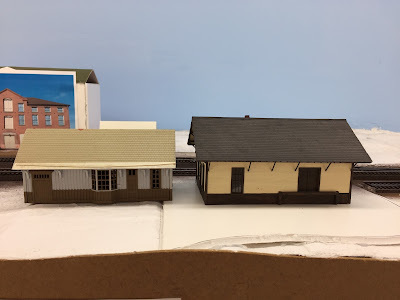 They're both HO scale - in so far as the windows and doors are HO scale. And that's a critical fact: you have to be sure your people actually fit. But what about the overall proportions? 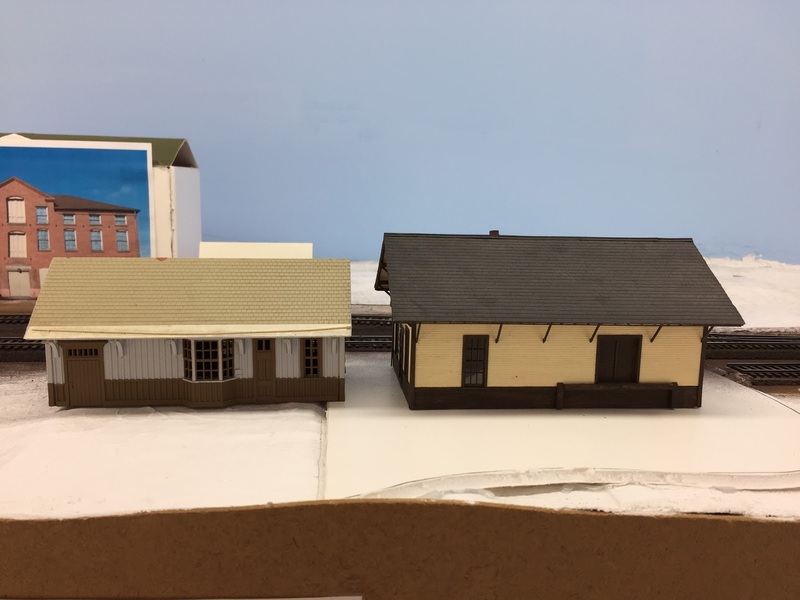 The Wethersfield station is a duplicate of the prototype, shrunk down to full 1:87 scale. The other station is, well, smaller. Which is more accurate? Well, certainly the Wethersfield station is accurate. I don't know about the other station model, though I suppose a cute little station like this exists/existed somewhere so maybe it's not actually compressed. Which looks better? Depends on the context. Certainly in my model version of Wethersfield, I'm going to use the Wethersfield station model. But over in East Berlin - where there also has to be a station, but there's much less space with which to work? 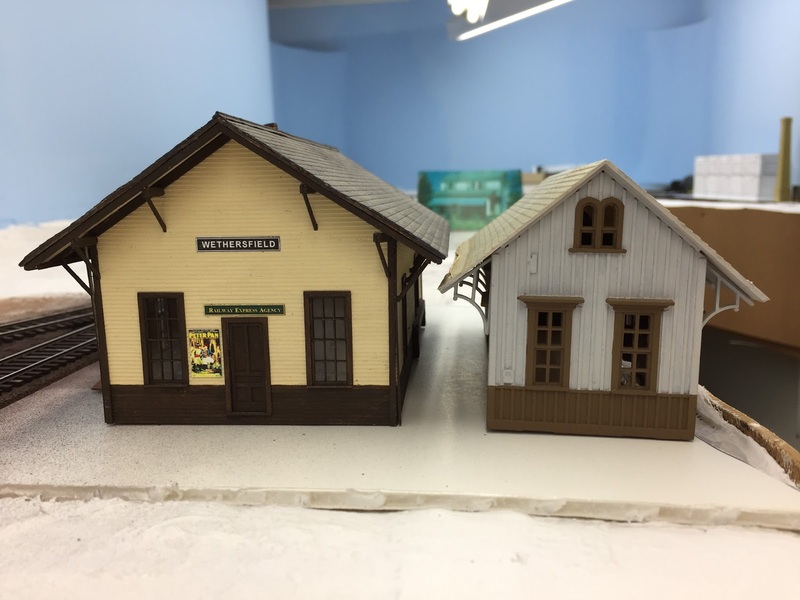 I'll probably do a compressed version of the Wethersfield station (the prototype was a similar style). 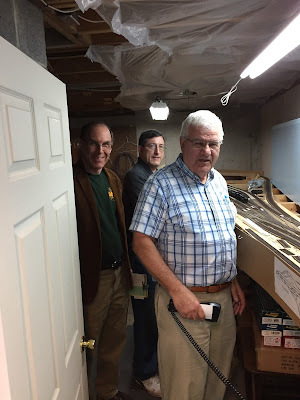 It all really boils down to the Art of model railroading as opposed to the science. Science demands perfect prototype fidelity in as many respects as possible. Sure, you might not have every bit of detail on your model as on the prototype (you might not even see some of those details in HO scale anyway), but you certainly want the dimensions to match. Unless doing so compromises the over-all effect. That's where art and intuition enter the picture. 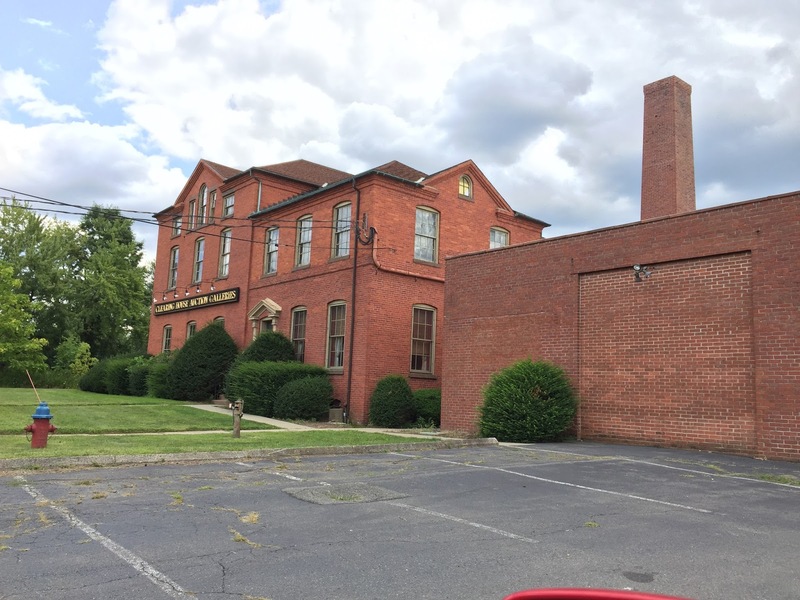 The next - and largest - structure in Wethersfield to be built is the Gra-Rock bottling plant. 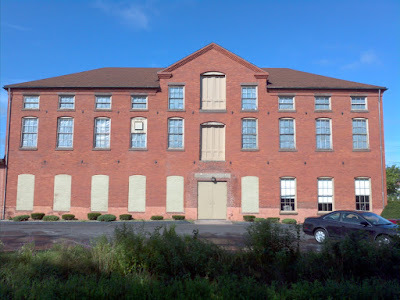 I've been debating whether to compress this building and, if so, to what extent. It's not a comfortable place for a left-brain thinker to be. I want it to be "right" and - to my mind - "right" can only mean "built to full scale size." But a full scale size mockup I tried overwhelms the Wethersfield scene. It's not as if I have the full 3 miles for this scene (180 feet) where a full-scale Gra-Rock would look right in context - I only have a bit less than 10% of that. Now, I'm certainly not going to compress Gra-Rock by 90% - but a full-scale version would look very out-of-place considering all its surroundings are already compressed. In other words, "right" would actually be "wrong" in this case. I've heard of some folks at the far left-brain/science end of the spectrum - building everything to perfect scale. 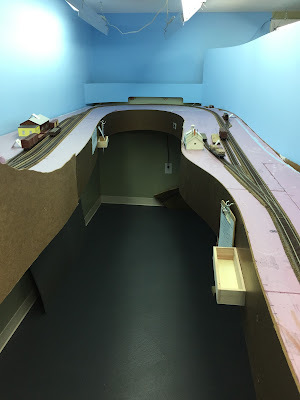 Their efforts are very impressive - but they typically have only enough room for a track or two and don't usually have the amount of operation I enjoy. And there are others that get a lot of joy and satisfaction from cramming as much as possible into their available space, with barely a nod to plausibility. Of course, most of us are somewhere in the middle - and the precise point on the spectrum probably has a lot to do with what "looks right" to your eye, given your space, even if it's technically "wrong." So where do you fall on the line? 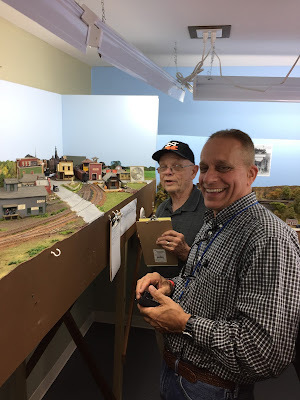 The Annual Reunion for the New Haven Railroad Historical & Technical Association was moved up again this year and as has been my habit the past couple of years, I opened up the Valley Line to give folks visiting from out-of-town the chance to operate. This time around there were a few changes/innovations from the most-recent ops session, which occurred just a little over a week previous. I was going to try one-man crews, but it turned out I had enough of a response that that only worked for one local. Even the Shoreline trains were fully staffed thanks to Tom - and good thing: turns out there was no way BillS would have been able to make it back & forth between "Points West" and "Points East" in time. 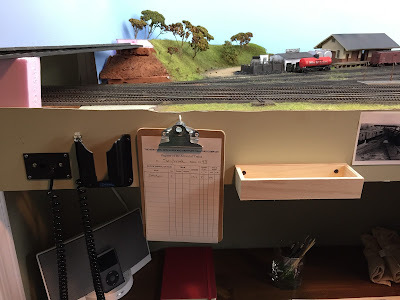 In order to cut down on the work the "desk jockey" has to do, I offloaded the Agent/Operator duty to a new "Train Register" located at each station. Now crews, instead of physically walking over to the desk to report their # of cars and get their work in town, they sign the register, note their cars, and take the switchlist and/or orders that are clipped to it for them. 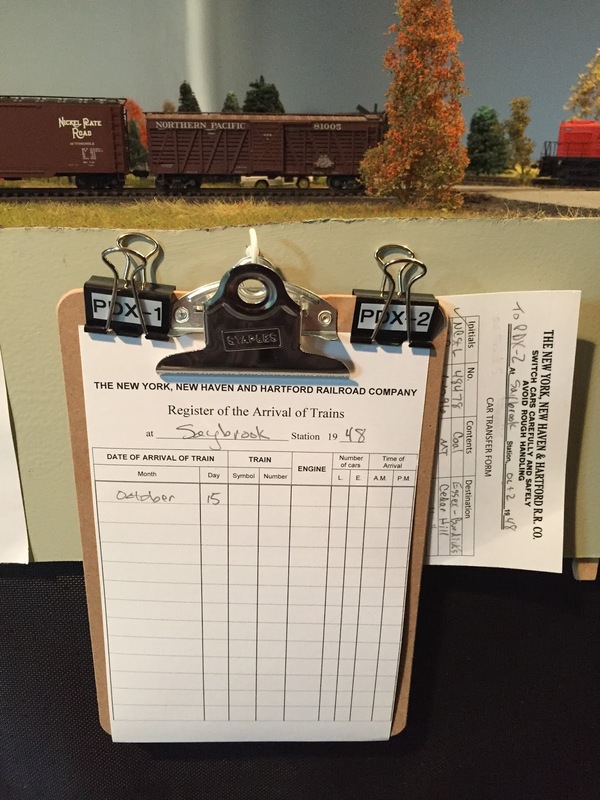 Train Register, with work clipped for PDX-2. This is in Saybrook - a town where two locals interchange cars. Other towns are served by only one local, so there's only one unlabeled binder clip that would hold their work/orders. Currently, all that is on a small clipboard hanging from a cup hook in each town. I thought I'd be able to get away with that long-term, but operating a bit myself afterwards I concluded that I really need to install bill boxes asap. Now, "all" the guy at the desk has to do is operate the mainline switches as the Saybrook Towerman. With all the traffic through Saybrook, that'll be enough to keep him busy! Crews can use this form to keep track of the cars they know they need to hand off and either give it directly to the crew receiving the cars, or leave it for that crew to pick up later (on the clipboard or in the eventual bill box) if they're not in town at the same time. It's admittedly a bit contrived/non-prototypical, but it serves as a plausible stand-in until I can get around to doing waybills. The final idea was to stagger the start times of the locals. Last session, it got a bit crowded in Saybrook with two locals in town at the same time, not to mention all the Shoreline trains going through. While that's perfectly in keeping with the prototype, it makes things a bit, um, "snug" in that area. Thankfully, it's also in keeping with the prototype to have the locals arrive in Saybrook at different times - which, in turn, means staggered starts. But I've been hesitant to institute this innovation since it would require some folks to hang around waiting for their work to actually begin. But it turned out, since some of the guys were on the Reunion Dinner Train and arrived later in the evening anyway, we got to try it. It worked a bit to reduce congestion - but not as well as one-man crews will, I suspect. So with all that as prologue, on to the session! Bill C, Tom D, and first-timer Bill L at New London/East End staging - Tom was the east end mole and the "Bills" were crew on PDX-2 out of New London up to East Haddam and then on to Cedar Hill. BillS was working the East End - all smiles since he doesn't have 4 guys on 2 crews to compete with for aisle space - yet. Mike, having just arrived to crew PDX-1 solo, waits his turn to sign the Crew Register. PeteL and another first-timer DonM work the Air Line Local (HDX-12) in Somerset. 2nd timer JimF and yet-another-first-timer DaveI all by their lonesome "way up in the chilly north on the branch" (i.e. in the other room with the windows open) working the Valley Local (HDX-7) in the Dividend section of Rocky Hill. BillL switches the westbound Shoreline local (PDX-2) while Mike - on the eastbound Shoreline local (PDX-1) switches the house track in Old Saybrook. More action at Saybrook Junction: PDX-2 (a.k.a. The Haddam Local) heading north up the Valley branch on the east leg of the wye while one of the many Shoreline express trains flies through town westbound. 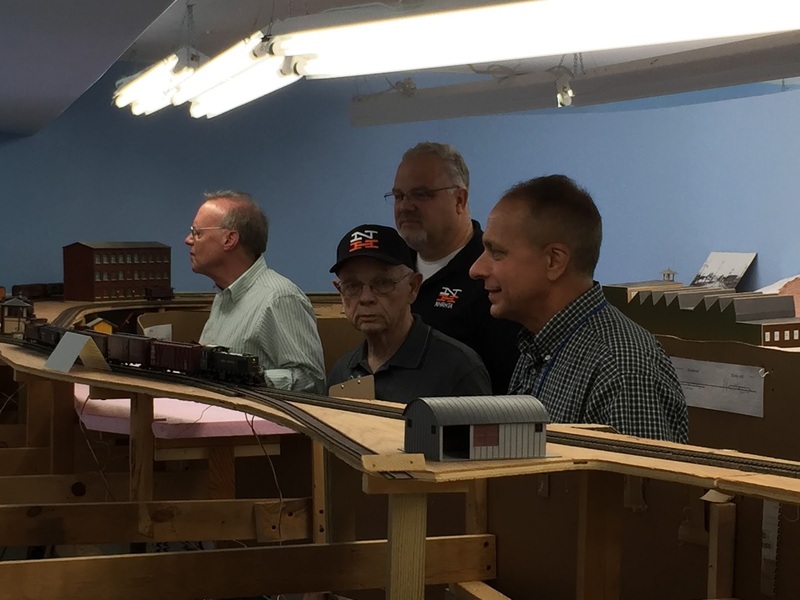 Meanwhile up in Middletown, the crews of the Valley Local and the Air Line local coordinate their switching and car swapping. Good thing there's a nice wide aisle here. . .
. . . unlike at East Haddam, where the aisle is somewhat - er - narrow. 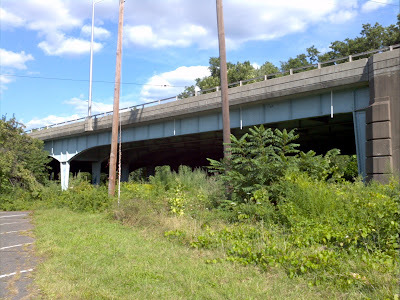 This is where the Valley Local (on the left) and the Haddam Local (PDX-2, on the right) swap cars. It was another really fun night with lots of laughter and a bit less stress than last time, due entirely to having the crews deal with each town agent via clipboard rather than in person. So I was able to enjoy the session a bit more - and even got to take these photos! As for the "laughter" part - well, I'll leave it to BillS to post his video of the Boston-bound Yankee Clipper. Let's just say, it didn't go quite as planned . . .
We had the usual minor glitches that every session seems to have - the occasional short (which, thankfully, was typically caused by human error and didn't shut down the layout), some confusion over the paperwork (I - admittedly - tend to have more of it than average), and some mechanical issues (mostly "prototypical" in nature - broken couplers, wonky engine operation, a derailment). But all in all - and at the risk of jinxing it - the layout is operating really well. Try one-man crews. It'll be interesting to see the trade-off between reduced congestion and added work for one guy (he'll have to man the throttle as well as manage the paperwork). I may keep the Valley Local as a two-man crew though, since it'd get awful lonely "way up north" all by oneself. 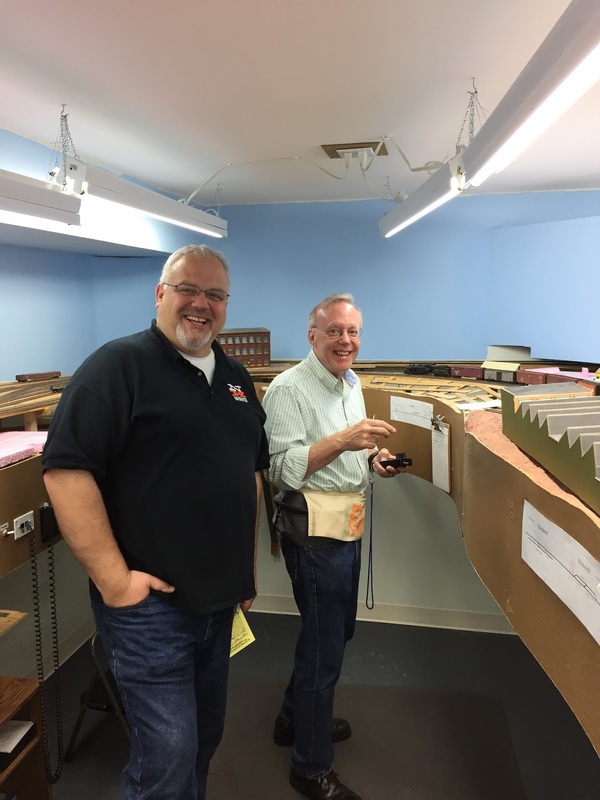 Related to the paperwork handling - install bill boxes. 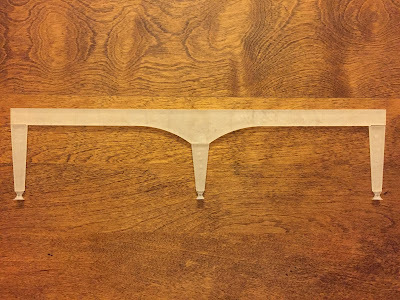 I've purchased 10 of those longer narrower ones (described here) since they seem more versatile and can hold more. Be on the lookout for ways to reduce the paperwork a crew carries - e.g. perhaps the content of the Job Card can be on the fascia at the towns where ops tips would be helpful and maybe the Loco Card info (function key assignments) can be taped to the back of the throttle. 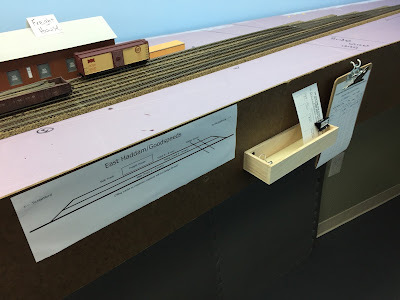 Speaking of paperwork, tweak the notes for the mainline moles to make it clearer which notes pertain to "Points West" staging and which pertain to "Points East" staging. Further adjust/dial in the DCC settings on my engines, especially momentum. I'm still learning how best to do this so it's a lot of trial & error. Any help or guidance to good resources would be appreciated! I'll be hosting a guest ops session during the NER convention in November, so I'm hoping to get a LOT more operations under my belt between now and then. In the meantime, and as always, please feel free to weigh in with feedback/tips/suggestions!